Embrace the delights of lakeside living at Nkwichi Lodge, an eco-traveler’s playground set on the virgin shores on the Mozambican section of Lake Malawi, which is known in Mozambique as Lake Niassa. 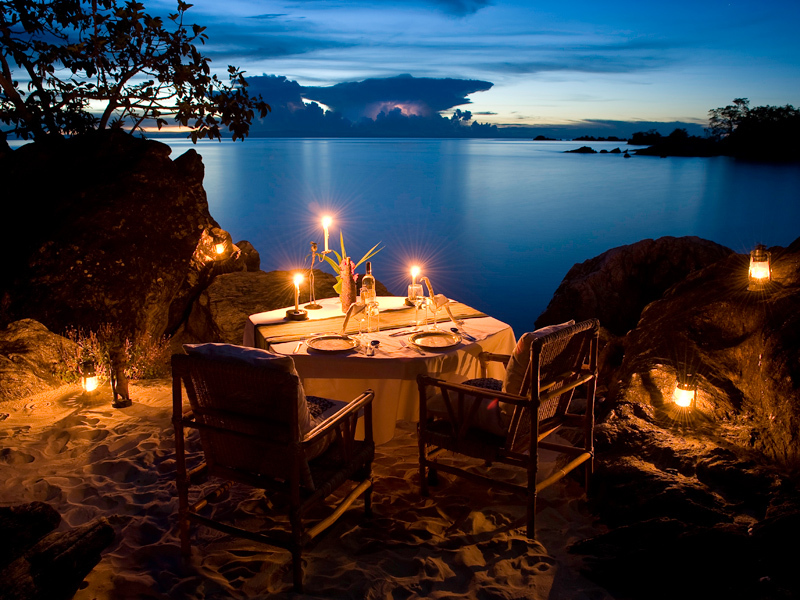 An off the beaten track holiday destination for those in search of a remote and tranquil escape, this Mozambique accommodation promises an unforgettable stay filled with romance and adventure. Nkwichi Lodge offers a choice of 6 chalets and 2 private houses, all catering to the needs of the discerning guest. Constructed using locally sourced materials, the lodge effortlessly blends into its surroundings. Each of the 6 chalets is tactfully tucked into the treeline and incorporates the surrounding trees and rocks into its design. En-suite bathrooms with showers suspended from overhanging branches and bathtubs carved from natural rock are features you can expect to find in the chalets. Families and groups can revel in style in either Makolo House which features high ceilings, 2 en-suite bedrooms, an upstairs platform as well as private access to the lake, or the Songea House and Chalet which boasts an open dining area, a sunken lounge, an upstairs room with private balcony and a separate chalet with en-suite facilities. Browse through the candid photos of Nkwichi Lodge for insight on why the lodge constantly receives glowing Tripadvisor and guest reviews. This is what guests had to say about Nkwichi Lodge – “I can recommend this lodge to anyone who loves pristine nature, remote and authentic places and friendly people…” Alain from Antwerp, Belgium wrote. “We have been coming here for over a decade and in all those years have never been disappointed… The setting and atmosphere are unique and the staff wonderfully helpful and friendly…” this is from Jaap from the Netherlands. Our consultants rate this Lake Niassa accommodation as one of the best eco lodges in the country and recommend it to eco-conscious travelers. We like this top Mozambique beach property for its remoteness and wonderful combination of excellent service, great food and fantastic activities.